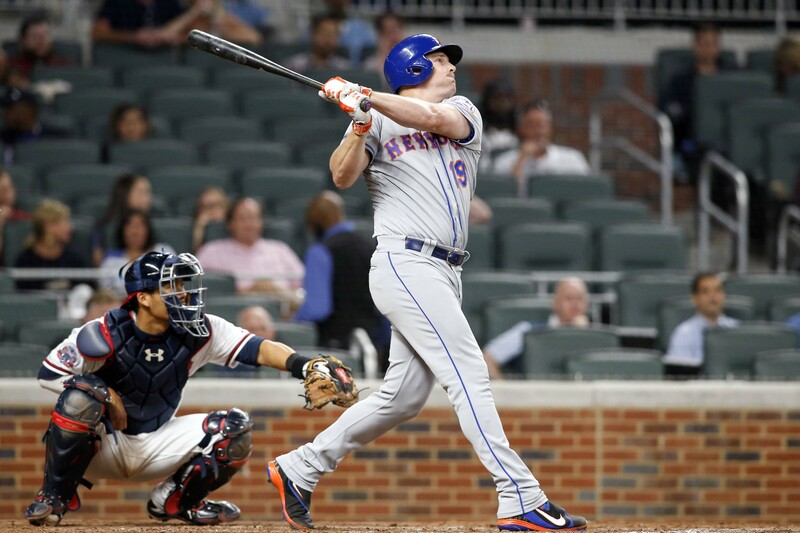 In March, James Wagner of the New York Times published an article detailing Jay Bruce’s quest to better understand why he struggled when he first joined the New York Mets last August. Bruce was supposed to help the Mets down the stretch when he was acquired on August 1 from the Cincinnati Reds in exchange for Dilson Herrera. Unfortunately, Bruce’s struggles in August overshadowed his rebound in September and October, which made many Mets fans furious when the team picked up his option and could not find a trade partner this past offseason. To prevent what happened last August from happen again, Bruce consulted the Mets’ director of baseball research and development, TJ Barra. The stats below tell the story that Wagner wrote and Barra explained to Bruce. During August 2016, Bruce was hitting a much higher percentage of ground balls and hitting it more to the opposite field instead of the center of the field. This resulted in a much lower on-base and slugging percentage. While Jay Bruce was able to rebound by the end of the season, the question remained which player would the New York Mets see in 2017: the one that made weak contact and hit too many ground balls or the one who would hit more fly balls, thus resulting in more home runs? The main question is whether Jay Bruce has just gotten lucky so far in 2017 or he has actually made adjustments on the statistical data. Bruce worked with the hitting coach Kevin Long and assistant Pat Roessler to try to improve his swing and launch angle, with an ultimate goal of a 50% fly ball ratio. And the changes he made have paid off as Bruce is at his highest fly ball ratio ever and extremely close to his 50% goal. One thing that has definitely helped the right fielder so far this season is that he has been more selective at the plate. He is swinging at a 25% less pitches outside of the strike zone, which has allowed him to make better contact. On balls in the zone, he is swinging less but making contact more often. While Bruce has been able to rebound from his poor performance with the Mets in 2016, it has been short-lived success. After getting off to a great start in April, he found himself in a rough slump in May, hitting just .210/.296/.430. At least part of the reason was due to Bruce’s getting away from what worked in April. His strikeout rate rose 36% from 16% to almost 22% and his OBP and slugging percentage dropped 74 points and 154 points, respectively, due in part to suffering from the 20th worst BABIP in all of Major League Baseball in May at .222 (the league-wide average in May was .298). What most likely caused the BAPIP to drop dramatically and the increased strike out rate is a faltering in his approach at the plate. Bruce entered the season looking to pull the ball more and hit more fly balls. In May, he stopped doing what gave him his success in April. Instead of pulling the ball, he ended up hitting it more towards center field and the opposite field. Although his fly ball rate was similar (albeit with a small drop), by not pulling the ball he sees less success when he makes contact. As a left-handed hitter, his fly balls will have a better chance of leaving the ball park if he were to pull them down the right field line. Instead, his HR/FB rate to drop from 18% to 14%. Not only did Bruce not pull the ball as much as he did the previous month but a higher percentage of balls he hit were soft contact. Hitting the ball softly, no matter where it is hit, is going to lead to a higher likelihood of outs. Hopefully for Jay Bruce and the Mets, this was a one-month phenomena and the rest of the season he can perform like he did in April. So far, June is looking up as his pull rate is back up to 50% with a hard hit ball rate of 45%. For the sake of a playoff push, and for Jay Bruce to try to cash in on his free agency after the season, both the team and the player hope this rebound is real. If it is, then it would be interesting to see if more players start to follow in Bruce’s footsteps to make some changes in response to the data. While The Only Rule Is It Has to Work, by former Baseball Prospectus Editor-in-Chiefs Ben Lindbergh and Sam Miller, shows some of the disdain towards data by players, Jay Bruce has proven that even a 30-year-old player in the prime of his career can make necessary adjustments based on it and potentially save their careers. Very informative article. One other factor is how much Bruce has struggled against lefties this season. Slugging only .245 versus career slugging of .413 against lefties.